Buffalo wings, hot wings, chicken wings, or wings are chicken wing sections (drummettes and flats) that are traditionally fried without breading and then coated in sauce. Left: A bowl of hot Buffalo wings. Classic Buffalo-style chicken wing sauce is composed of two ingredients: a vinegar-based cayenne pepper hot sauce and butter. Buffalo wings are traditionally served with cut celery and blue cheese dressing. 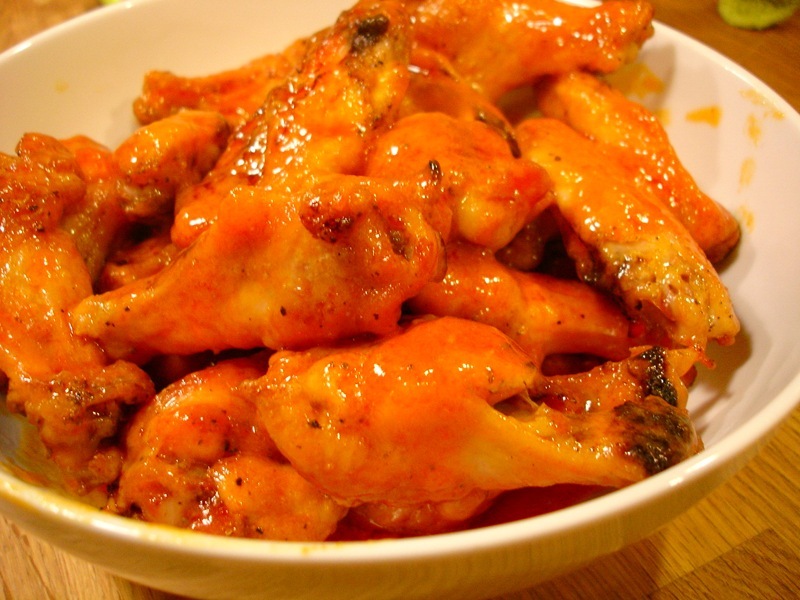 Buffalo wings are named after their city of origin, Buffalo, New York. The local residents of Buffalo generally refer to them as "wings" or "chicken wings" rather than "Buffalo wings". The appellation "Buffalo" is also now commonly applied to foods other than wings (such as chicken fingers, chicken nuggets, and popcorn chicken) that are seasoned with the Buffalo-style sauce or variations of it. Cayenne pepper hot sauce and melted butter or margarine are the basis of the sauce. Buffalo wing sauce can be made with a variable amount of heat/spiciness, with the names of these sauces generally corresponding to the level of heat, such as mild, medium, or hot. Typically, the wings are deep-fried (although they are sometimes grilled or baked), drained, placed in a bowl with the sauce, tightly covered, and shaken until the wings are evenly coated. Plain wings can also be served. In most cases, each contains the same base sauce but varies in the amount of butter or margarine and hot sauce used. Wings can also be served dry with the sauce on the side.